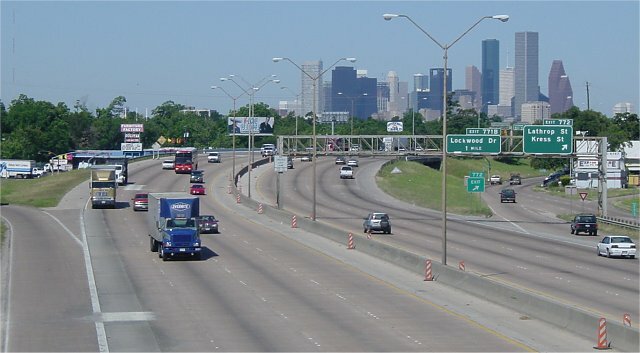 Interstate 10 east was among Houston's earliest freeways, with most of it open by the mid 1950's. It has been improved and expanded since then, of course, and today you could classify it as a typical Houston freeway. 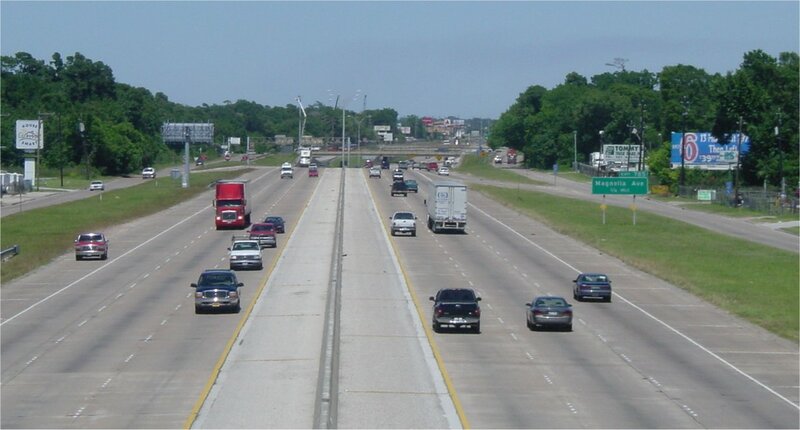 IH-10 east was historically known as the East Freeway until around 1990 when the city of Baytown started to promote the freeway as the Baytown-East Freeway. Apparently this is not an officially designated name, but the name "Baytown-East" is in widespread use. The east freeway remains free of traffic congestion, even during rush hour. 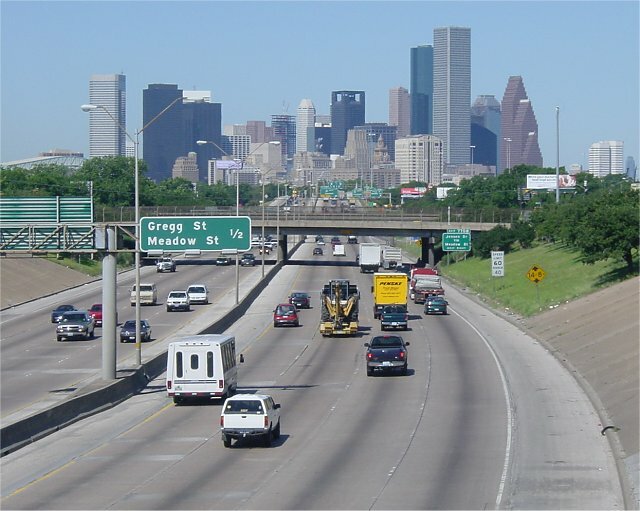 A 1999 Houston Chronicle article reported and average speed at rush hour of 60 miles per hour, just about the same as the non-rush hour speed. No major expansions of IH-10 are planned in the near-to-intermediate future. 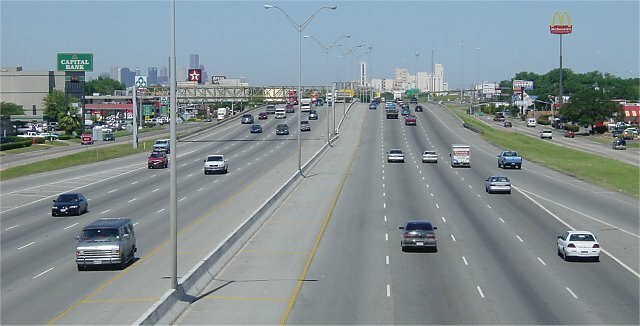 Howevever, the East Freeway corridor is scheduled to be the subject of a major investment study within the next few years. The major investment study will determine how much new capacity, if any, will be needed in the future. In the near term, completion of the IH-10/IH-610/US 90 interchange is scheduled for a 2002 contract award. This will be the first project of several that will build the Crosby freeway inside Beltway 8. 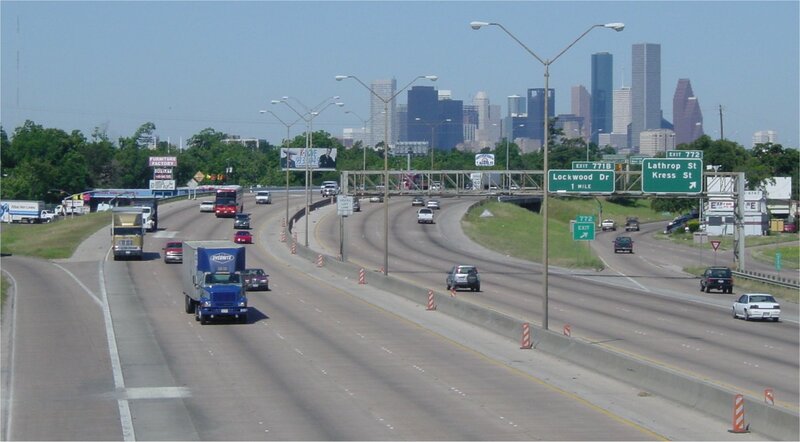 Also, construction of the eastern segment of the Grand Parkway will begin in 2002 or 2003, intersecting IH-10. 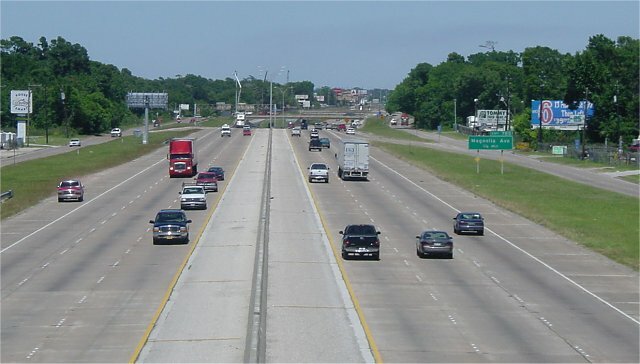 A 1999 Houston Chronicle article provides more information on IH-10 east. 1952 A 1952 road map shows the first section of freeway under construction between today's IH-610 and Beltway 8. The roadway was known as state highway 73 in those days. 1956 The freeway is completed from US 90 (just inside Loop 610) to the east side of the San Jacinto River. The facility has four main lanes. 1966 The 8-lane freeway is opened from US 59 (downtown) to US 90 (just inside IH-610). 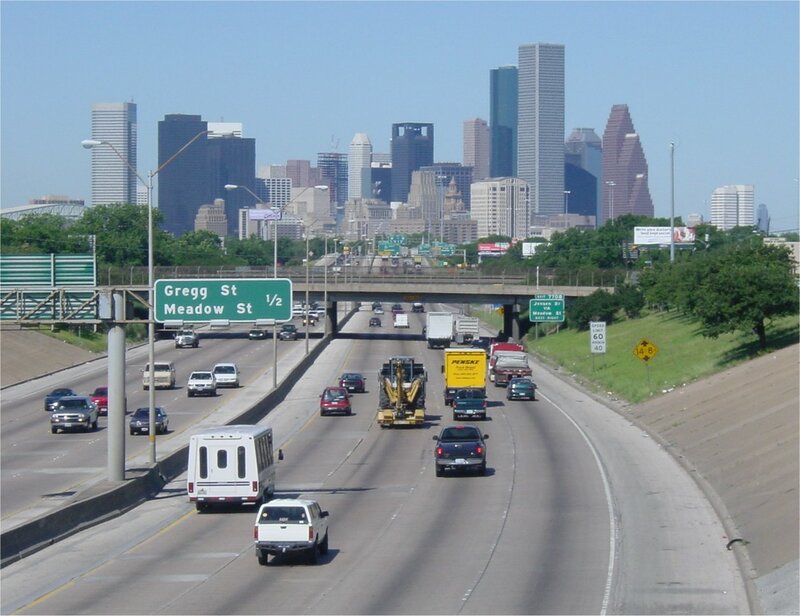 May 17, 1972 The downtown section of IH-10 is opened, completing IH-10 in Houston and connecting the Katy Freeway to the East Freeway. 1984 The section from IH-610 to Beltway 8 is expanded to 8 main lanes. 1994 The four-level stack at Beltway 8 East is completed. 1990's Various small expansion projects are completed, including the addition of lanes east of Beltway 8 to provide a continuous 6 main lanes, and additional merging lanes at the IH-610 interchange. 2003 Scheduled completion of the reconstruction of the interchange at US 59 (downtown). (high resolution 184k) A. Looking westward towards the downtown skyline from just east of downtown. This section of freeway was completed in 1966, and is in its original, as-constructed configuration. Photo taken 22-May-2001. (high resolution 128k) B. Inside Loop 610, much of the freeway is depressed below grade or elevated on embankment. This view shows a section on embankment. Photo taken 22-May-2001. (high resolution 128k) C. Looking west at the Lathrop exit, with downtown Houston in the background. Photo taken 22-May-2001. (high resolution 159k) D. Looking west at the Mercury Street overpass, which is just outside loop 610. Photo taken 22-May-2001. (high resolution 119k) E. Looking east near Magnolia street, which is just outside Beltway 8. Outside beltway 8, the East freeway has 6 main lanes. Photo taken 22-May-2001.